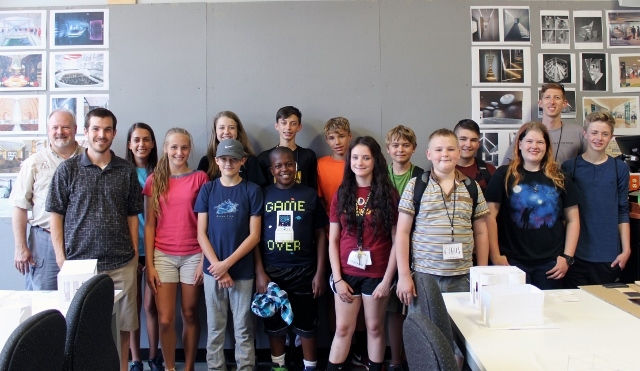 For the first time, Appalachian State University design educators held a summer camp for high school students in North Carolina—introducing the youngsters to industrial and interior design. “Many of them were unaware of what industrial design was,” says Assistant Professor Michael Rall, IDSA, “so it was great to expand awareness of the field." The two-day camp was attended by more than a dozen, rising 9th and 10th grade students from two western counties. Rall, who's also the IDSA Student Chapter advisor at App State, says the camp could be expanded to welcome students from other parts of the state next summer​. The students completed projects in industrial and interior deisgn; next year, apparel design may be added to the mix. The camp was led by Rall and Alex Poorman, associate professor of interior design, with the help of GEAR UP (Gaining Early Awareness and Readiness for Undergraduate Programs) and Bradley Tunstill, program coordinator, entrepreneurial education. The GEAR UP NC Appalachian Partnership is a federal grant program awarded to App State, providing college access resources and support to more than 14,000 students in 11 western NC school districts. Students used recycled paperboard to create innovative light fixtures based on a popular mountain outdoor such as skiing, snowboarding, camping, rafting, hiking, etc. Students also learned some basic drawing techniques such as two-point perspective, shading, line weights and marker rendering, and about the many careers available in industrial design. They watched a digital presentation and short videos. "The campers were exposed to the many opportunities that would be available to them as industrial designers, from designing vehicles to furniture and electronics to accessories. The campers did a great job of using the design process to complete the project each day, and in the end each one went home with something they designed and created."